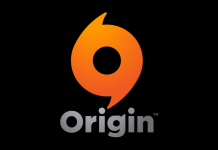 On this page you will find information, included content and in game photos of each Sims 3 World released for purchase in The Sims 3 Store. Click the world’s name tab for complete details. ❗ Click on the name tabs for complete details of each world. ❗ Worlds are listed in order of release, so scroll down for more. 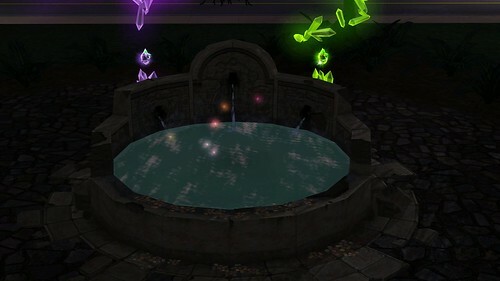 The Wishing Well is the new premium content available only with Lucky Palms. Sims can wish for a variety things, but not all wishes bring the best! 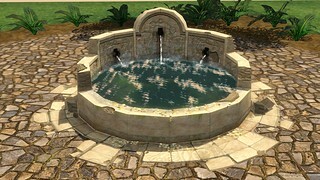 Besides wishes, Sims can also use the Wishing Well to Steal Coins and Fish. Stealing coins can be a bit tricky, so make sure your Sim doesn’t fall in and get sopped. If your Sim is lucky and finds a coin to steal, the coin will be placed in their inventory. 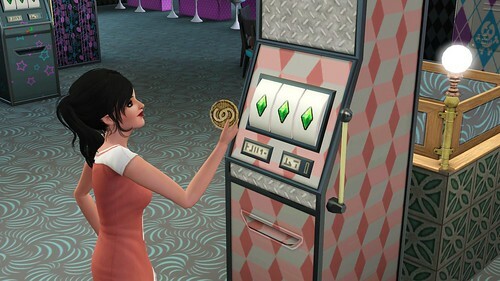 ❗ Stealing coins from the Wishing Well will allow your Sims to play the Lucky Coin Stakes when the Slot Machine is installed. Jackpot is 7,500 Simoleons. ❗ If you have the Tree of Prosperity on the same lot as the wishing well, pixies & fireflies will surround the well during the night. Sims have five options when it comes to wishes, and they can wish for them as many times as they want. Wishes won’t come true every time, but sometimes a wish can bring your Sim a special surprise! Pick and choose those wishes wisely! ♦ Wish for Love – When wishing for love, a frog jumps into your hands and puckers up for a kiss. If you are lucky, the frog will turn into a real life prince, and automatically become a Romantic Interest! If it’s just not a lucky day, the frog will jump back into the wishing well. ♦ Wish for a Child – Wishing for a child can bring all sorts of surprises! This wish is granted by giving your Sim an Infant, Evil Child or if you have the Sims 3 Pets expansion installed, kittens and puppies! Whichever your Sim is granted automatically becomes part of the family. ♦ Wish for Happiness – Wishing for happiness will give your Sim a “Happy in the Moment” or “Euphoric” moodlet that boosts their mood for 3-6 hours. 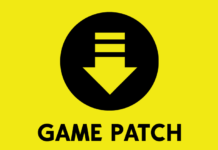 ♦ Wish for Power – Wishing for power gives your Sim a promotion in their current job and also serves as a new way to select from available jobs when a Sim in unemployed. ♦ Wish for Wealth – Wishing for wealth is a hit or miss wish. If you hit this wish, your funds will increase by a variety of amounts. If you miss this wish, pixies will throw the coins back to your Sim and advise them to stop throwing money into the well! The Serenity Retreat is an exclusive Sunlit Tides Gold Edition Venue. This venue is home to the exclusive Gold Edition Infinite Zen Massage Table & Outdoor Shower. 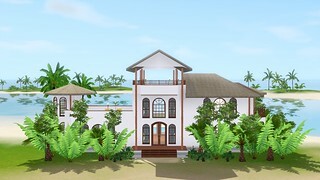 Besides being a new hangout for Sims, this venue also serves as a venue for marriage, and a place for Sims to give and receive massages. The Infinite Zen Massage Table is a great way to help your Sims relax and build relationships. Sims can gain romantic boosts and even gain the chance to conceive twins or triplets! You can find the chair in buy mode under “Hobbys and Skills” for 550 Simoleons. The Massage Table can be used by Sims Teen-Elder. ❗ The Massage Table can fulfill Wishes that only the Day Spa would be successful at fulfilling. ♦ Acupuncture – Poke, poke, Ouch! The Steam-It-Up Sauna is a way for Sims to blow off steam! You can find the sauna in buy mode under “Plumbing” for 2,500 Simoleons. The Sauna can be used by Sims Teen-Elder. 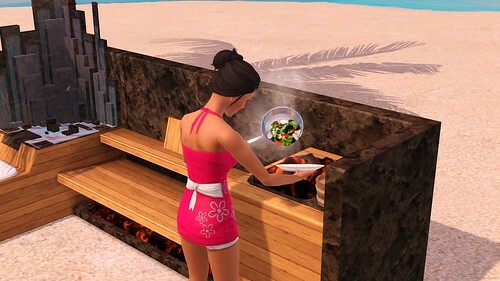 ❗ If your Sim has vegetables in their inventory, they can use the Sauna to cook up some Steamed Veggies! The Woodfire Oven offers advancement in the Cooking Skill, while teaching Sims brand new recipes. You can find this oven in buy mode under “Misc Appliances” for 1,200 Simoleons. 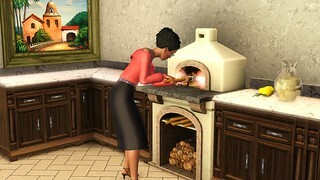 The Woodfire Oven can be used by Sims Teen-Elder. ❗ This content raises the Cooking Skill, and adds brand new recipes. ❗ Sims with a low Cooking Skill are more likely to burn food dishes. ❗ If you have The Sims 3 Showtime installed, Genie’s will be able to summon all recipes. 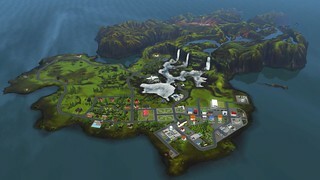 The Sims 3 Monte Vista comes complete with a brand new community lot. 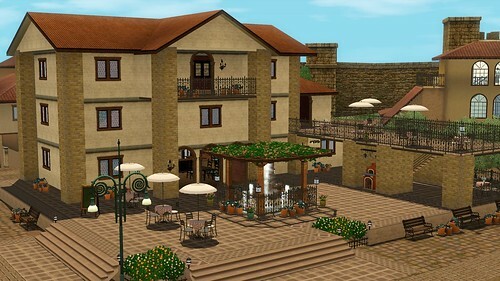 The Public Pizzeria comes equipped with the Woodfire Oven premium Content, and is a hangout lot for Sims to eat and relax. ❗ This community lot does not include any NPC Waiters/Servers. ❗ NPC Sims from around town will autonomously use the woodfire oven when on this lot. ❗ This community lot is NOT a rabbit hole. Aurora Skies comes complete with an “aurora borealis” feature. During the night when clouds roll through town, look out for some wonderful color displays in the sky. Tiny Prodigies Early Learning Center is an exclusive Aurora Skies Gold Edition Venue. This venue is home to the exclusive Gold Edition Local Motion Toddler Walker & Head Start Playpen. Besides this venue being a new place for townies to hang out, it is also the perfect venue for children of all ages. The Local Motion Toddler Walker is a new way for Toddlers to boost their fun motive. Toddlers who are ambitious enough, can even teach themselves to walk. 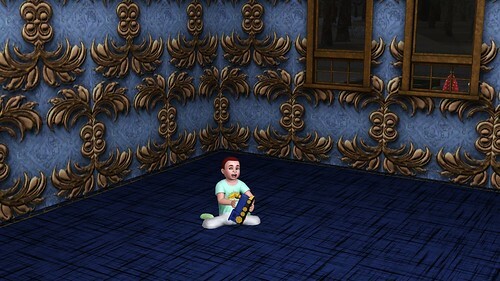 You can find the toddler walker in buy mode under “Kids Furniture” for 50 Simoleons. 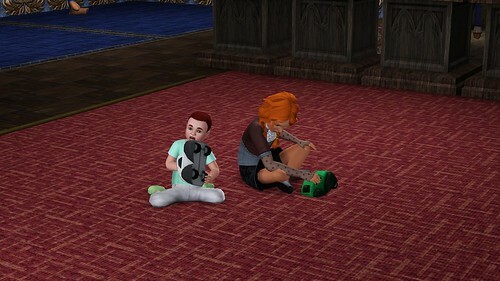 The Toddler Walker can only be used by Toddler Sims. 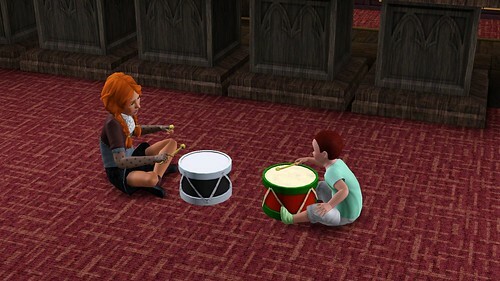 When a Sim Teen-Elder places the child into the walker, they have the option to “Play” or “Learn to Walk”. The walker allows Toddlers to walk around freely, and go from one end of the lot to another! Whether they choose to play or learn to walk, they will always be in a happier mood. 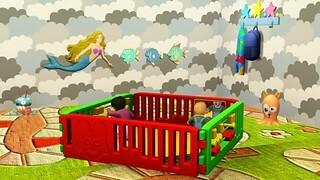 The Head Start Playpen is a new way for Toddlers to boost their fun motive. Toddlers who are ambitious enough, can even teach themselves to talk. 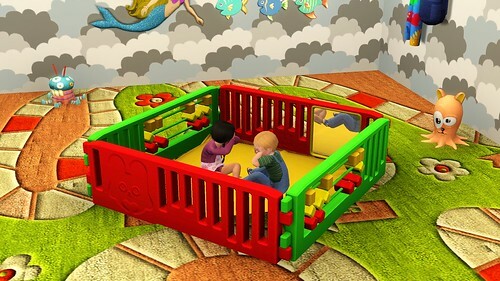 You can find the playpen in buy mode under “Kids Furniture” for 50 Simoleons. 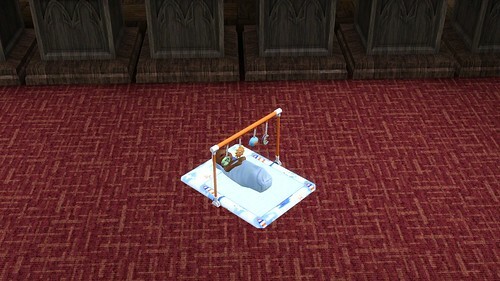 The Playpen can only be used by Toddler Sims. 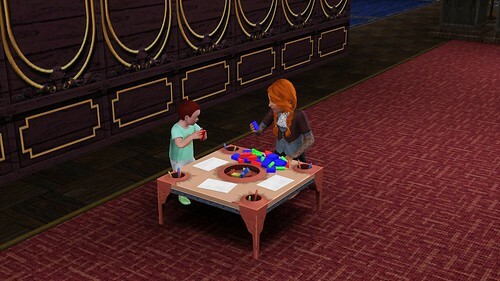 When a Sim Teen-Elder places the child into the playpen, they have the option to “Play” or “Learn to Talk”. The playpen allows Toddlers to boost their fun motive, and also get a head start on learning! Whether they choose to play or learn to talk, they will always be in a happier mood. The Hot Air Balloon is a new form of transportation around town, as well as a new place to relax and enjoy a day outdoors. 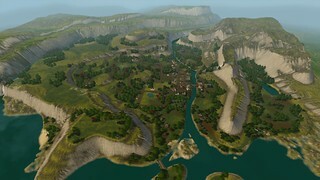 Sims can enjoy a day of sightseeing, teleporting around, and even a little woohoo. You can find the hot air balloon in buy mode under “Misc. Entertainment” for 12,900 Simoleons. 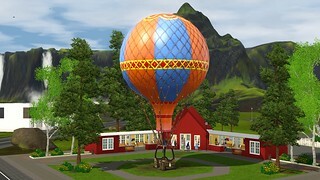 The Hot Air Baloon can only be used by Sims Teen-Elder. ❗ The Hot Air Balloon only accommodates up to two Sims. The hot air balloon is a large 10×10 object, which hovers about 10-15 feet directly above the point of takeoff. It is important to know that the Hot Air Balloon does not glide over the town. 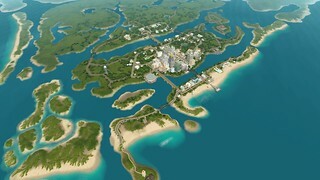 Instead, it serves as a teleportation pad that teleports along with the Sim(s) to another location. Duke of Bows Renaissance Faire is a separate, yet related venue. This venue is home to the exclusive Fit as a Fiddle Violin and Archer’s Gauntlet. This venue also unlocks the Black Dragon for use within your game when you have The Sims 3 Dragon Valley World installed. 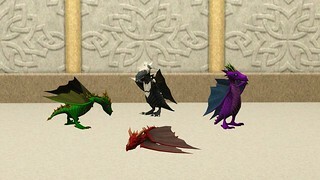 The Red, Green, Purple and Black Dragons are small pets with special abilities. Before hatching into Baby Dragons, you will need to purchase the Dragon Eggs in buy mode under “Misc. Entertainment” for 395 Simoleons. 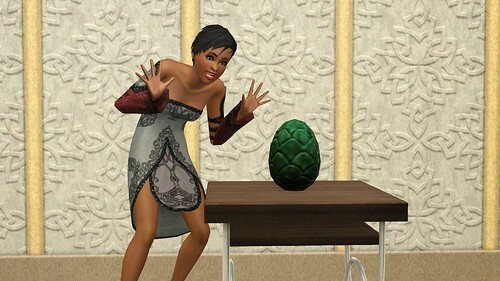 The Dragons and their Eggs can only be used by Sims Child-Elder. Once you have purchased the Dragon Egg, you will need to “Talk to” the egg in order to hatch it. There are a number of socials you can use to interact with the dragon eggs, and once you speak to it, it will enable the 6 hour hatching time. Once the six hours are up, the Dragon Egg will hatch into a Baby Dragon. Once your Dragon Egg hatches into a Baby Dragon, there will be plenty to do with them. The “super powers” your Baby Dragon possesses, will depend on the color of their skin. Each baby dragon is equipped with special abilities that make them all unique. Each of the four baby dragons can be fed, played with, carried, and even fly around in areas where there’s enough room to do so. Click a baby dragon and select any of these interactions at any time. ❗ While Sims can own as many baby dragons as they choose to, they can only have one of each Baby Dragon color stored in their inventory at one time. ❗ Be sure to name your Baby Dragon immediately. If you do not name your baby dragons, townies will be able to run off with them. 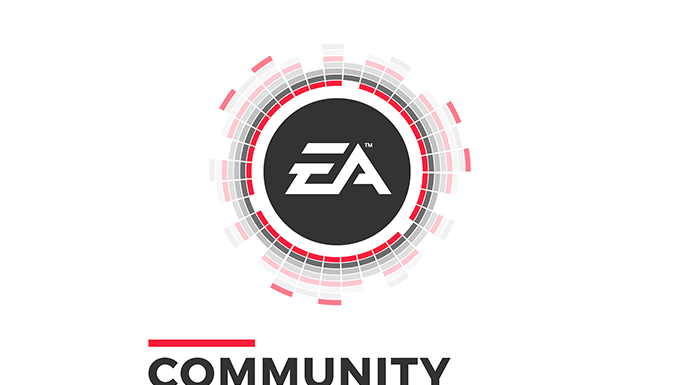 ♦ Talk about Athletic – Using this interactions allows Sims to gain and level up in the Athletic Skill. This process is not the fastest method of increasing a Sim’s Athletic Skill, but it gets the job done on the go! ♦ Mark of the Red Dragon (Moodlet) – Sims who are around Red Baby Dragons will receive a boost in the Energy and Hygiene motives. 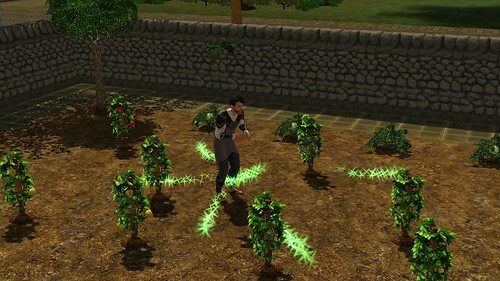 ♦ Talk about Gardening – Using this interactions allows Sims to gain and level up in the Gardening Skill. This process is not the fastest method of increasing a Sim’s Gardening Skill, but it gets the job done on the go! ♦ Summon Treasure – When using this interaction, Green Baby Dragons will summon collectibles of all types. From Goldfish, to Rainbow Gems, these earthly dragons will bring it all! ♦ Mark of the Green Dragon (Moodlet) – Sims who are around Green Baby Dragons will receive a boost in the Hunger and Bladder motives. 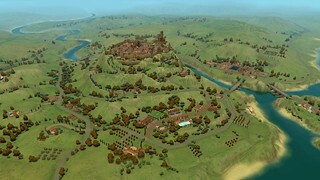 ♦ Talk about Charisma – Using this interactions allows Sims to gain and level up in the Charisma Skill. This process is not the fastest method of increasing a Sim’s Charisma Skill, but it gets the job done on the go! 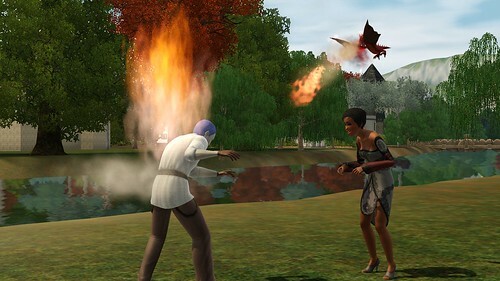 ♦ Summon Someone New – When using this interaction, Purple Baby Dragons will summon a random townie. Interacting with these summoned townies will allow a Sim to make new friends. ♦ Be the Life of the Party – When using this interaction, Purple Baby Dragons will improve any party around town. If your Sim is hosting a party at home, the outcome of the party will significantly increase. If there are no parties on your home lot, this interaction will improve any parties happening around town. If there are no parties happening around town, there will be nothing to improve. ♦ Cast Rune Charm on… – When using this interaction, Purple Baby Dragons will cast a “Happy” charm on the receiving Sim, giving them a massive mood boost for up to twelve hours. This interaction will also remove the “Singed” moodlet, and change Sims into their regular non-singed clothing. 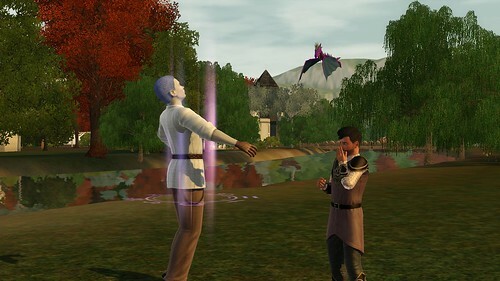 ♦ Mark of the Purple Dragon (Moodlet) – Sims who are around Purple Baby Dragons will receive a boost in the Fun and Social motives. 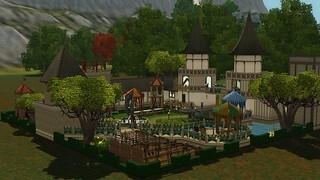 ❗ To Unlock the Black Dragon, you must have The Sims 3 Dragon Valley World, and The Duke of Bows Renaissance Faire Venue installed. ♦ Talk about Logic – Using this interactions allows Sims to gain and level up in the Logic Skill. This process is not the fastest method of increasing a Sim’s Logic Skill, but it gets the job done on the go! ♦ Summon Ghost – When using this interaction, Black Baby Dragons will summon a random ghost from around town to haunt the active lot. ♦ Summon Death Flower – When using this interaction, Black Baby Dragons will summon a Death Flower. 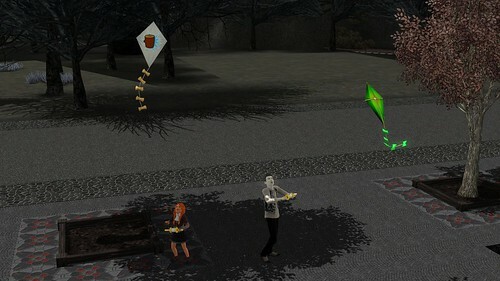 Death Flowers can be used to evade the Grim Reaper should something happen to your Sim. This interaction can be used infinite times. ♦ Cast Phantasmal Curse on… – When using this interaction, Black Baby Dragons will infect the receiving Sim with the “Zombified” moodlet. The moodlet lasts for 6 hours, and turns Sims into Zombies! Aaaarrrggg! The Fit as a Fiddle Violin is a brand new skill based instrument. You can find the violin in buy mode under “Hobbies & Skills” for 600 Simoleons. 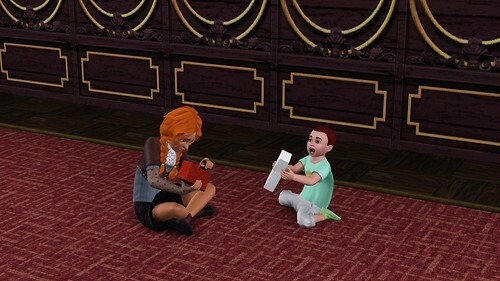 The Violin can only be used by Sims Child-Elder. 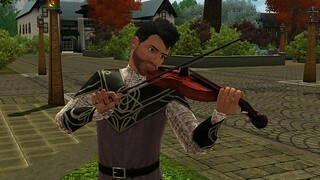 Sims who play the Violin will begin to increase their Violin Skill. The Violin Skill has 10 levels, each unlocking new interactions and compositions. 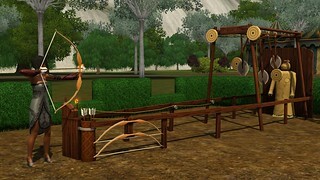 The Archer’s Gauntlet is a brand new object which helps Sims raise their Athletic Skill. You can find the archer’s gauntlet in buy mode under “Misc. Entertainment” for 1,250 Simoleons. The Archer’s Gauntlet can only be used by Sims Teen-Elder. Success with the Archer’s Gauntlet depends highly on a Sim’s Athletic Skill. 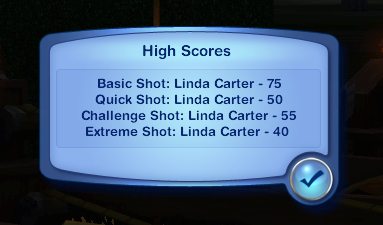 Sims with a higher Athletic Skill are more likely to receive the mood boosting “Marksman” & “Eagle Eye” Moodlets, and also dominate the score board. 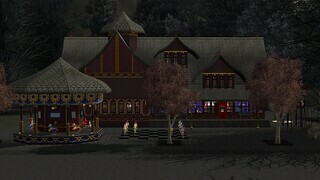 Midnight Hollow comes complete with a rare “red sky” effect. During the night when clouds roll through town, look out for an eerie color display in the sky. The Golden Ticket Toy Shop is a separate venue included with the Gold Version of this world, and is home to the exclusive Titanic Toy Machine. 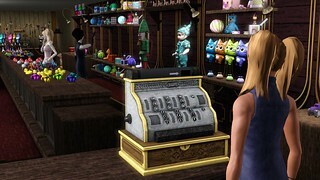 This venue also includes the Savvy Seller’s Register, which allows for the toy shop to be a functional business. 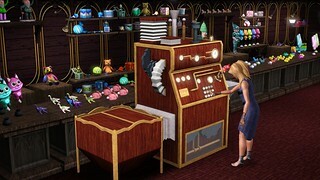 The Titanic Toy Machine allows Sims to create an array of new interactive toys. You can find the toy machine in buy mode under “Misc. Entertainment” for 1,900 Simoleons. 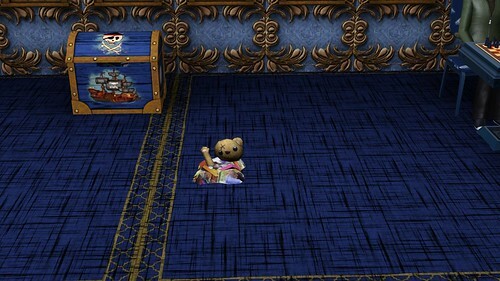 The Toy Machine can be used by Sims Child-Elder. ♦ Misfit Monstrosity (View Only) – This is the result of Sims failing to create a toy in the machine. ♦ Kite (Child – Elder) – Kites attract lightning and Sims who fly a kite run the chance of being struck by lightning even without Seasons installed. 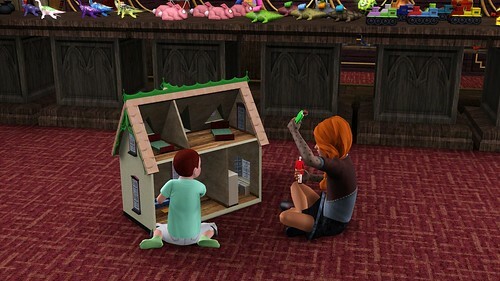 Aside from creating a specific toy from the list above, Sims can also choose to create a “Random” toy. When selecting this option, Sims will create one of the above mentioned toys. 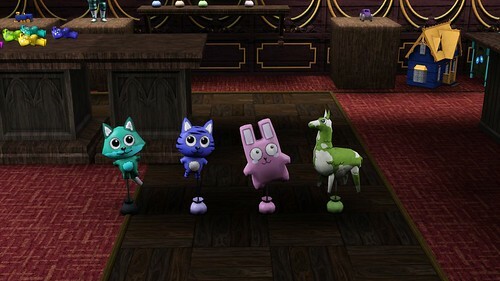 Toys can be created with the Toy Machine, or purchased directly via BuydeBug & the Toy Store. The Savvy Seller’s Collection consists of brand new objects that allow your Sims to run a business. The main object used to run a business is the register, and you can find it in buy mode under “Misc. Entertainment” for 100 Simoleons. The Register can only be used by Sims Teen-Elder. Aside from the register enabling any lot to run as a functioning business, this premium content also includes rugs, pedestals, wall shelves, and a car space, used to showcase items when creating a business in any world. Any and all buy mode objects placed on these showcase items are automatically enabled for sale. ♦ Cash Register: The cash register allows your active household (teen and older) to “Tend” to the business, check sales performance, set lot hours, hire and fire Salesclerks (NPC’s), and browse the selection of items for sale in on any business lot. ♦ Shop Door: The shop door allows you to give the business a name, and set the opening and closing times for the shop. Unlike the register, the shop door dictates what time the business closes, rather than what time the lot shuts down. Both the register and shop door can have the same opening and closing times, but the door allows for you to give your current shoppers more time to browse when the lot no longer accepts any more visitors. ♦ Pedestal: Items placed on this object will be automatically enabled for purchase. You can set the Markup, Sale Price, and purchase items directly from this object. ♦ Rugs (5 sizes): Items placed on these objects will be automatically enabled for purchase. You can set the Markup, Sale Price, and purchase items directly from these objects. 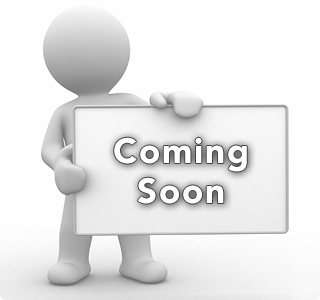 ♦ Shelf: Items placed on this object will be automatically enabled for purchase. You can set the Markup, Sale Price, and purchase items directly from this object. ♦ Parking Space: Cars placed on this object will be automatically enabled for purchase. You can set the Markup, Sale Price, and purchase items directly from this object. To create an run your own business on a commercial lot, place any of the Savvy Seller’s Collection showcase items on the lot, place objects from buy mode on them for purchase, be sure to include a register to enable the lot as a functioning business, and label the lot as a “Hangout”. ❗ When creating a business on your home lot, you must “invite” other Sims over to shop. Residential lots will not automatically attract buyers. 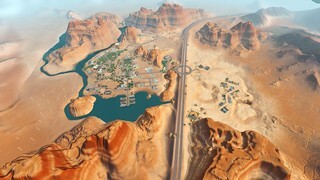 ❗ To make a profit while running a business, you will need to purchase the community lot on which the business is located. ❗ Items in your shop will automatically be replaced when purchased, which ultimately allows for huge profits. There is no restocking fee. The Boardwalk Venue can be purchased separately, and is home to the exclusive Sky High Roller Coaster. 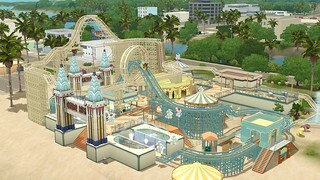 The venue “completes” the theme, includes the brand new roller coaster Premium Content, and includes several new objects and decor. The Boardwalk Attire Set is an exclusive to the Roaring Heights Gold Edition. Included are two outfits for both male and female adult Sims, as well as one each for elders. 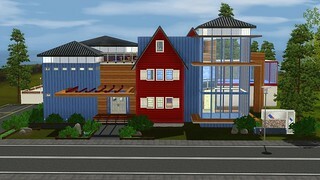 The Classically Cool Fixer-Upper Car is a skill based hobby-like vehicle for Sims. You can find the toy machine in buy mode under “Misc. Entertainment” for 1,900 Simoleons. 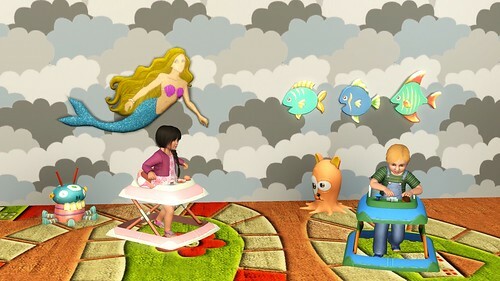 The Toy Machine can be used by Sims Child-Elder.